As a veterinary practice we are well placed to provide for those cats who need any medical supervision, such as those requiring tablets and injections as well as special medical diets, or for those cats that simply need closer veterinary supervision whilst their owners are away. We have all new, spacious, sneeze-proof cat cabins in our separate cat in-patient facility for up to 8 cats. All cabins are cleaned throughout the day and all the cats receive close attention from our nursing staff (including cuddles!). Our cat cabins are large and bright with 2 levels for cats to jump between. In addition to blankets, all cat cabins now have their own igloo for relaxation and we also supply cats with cat toys to play with. All our in-patient guests must have up to date vaccination and flea treatment before admission and all cats staying over 5 days will receive free Frontline flea treatment during their stay. All the cats are routinely fed on Hills Feline Maintenance diet but we understand many cats have their own special diets or preferences and so we are happy to feed your cat your own food, if provided. We are delighted that the new clinic and its facilities have been awarded silver standard Cat Friendly Clinic status from the International Society of Feline Medicine (ISFM). 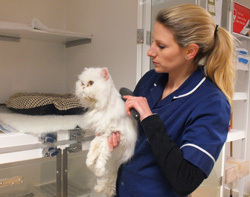 This means that the Brompton Veterinary Clinic has achieved the numerous requirements of design, equipment and the level of care and special understanding for cats and their needs. Christmas is a very busy time for everyone at the clinic and we are usually fully booked by the end of November. 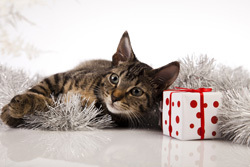 The daily price is the same year round but we do ask for a non-returnable deposit at the time of booking for each cat and please note there is a minimum boarding fee of £120 for each cat staying with us either over either Christmas or over New Year. Please telephone the clinic on 020 7225 2915 for prices.